Acknowledging the dynamic complexity of nature requires conceptual tools that are equally complex. If we are to develop accurate concepts for the categories of Life and Mind we need to make use of simulation models in order to develop an ontology that meets the demands of natural complexity. Simulation models are not only used to model existing natural processes (from convection cells and fluid dynamics to the visual cortex and neural spike patterns) but also for conceptual modelling: i.e. to frame, illustrate, develop and formalize more generic concepts such as “emergence”, “life”, “adaptation”, “cognition” or “consciousness”. I work with simulation models in two major fields of research: origins and minimal forms of adaptive agency in protocellular systems and minimally-cognitive tasks, development, learning and habit formation in robots (to illustrate and further develop the notion of Mental Life). I started working on this model almost 5 years ago. I had to put it aside to finish my PhD but I have recently recovered it to explore the dynamic organization of habits and minimal cognition in situated robotics. The ultimate goal is to build a model of sensorimotor autonomy, the capacity of a system to generate and sustain a sensorimotor organization and interactive norms out of a history of interactions in a specific environment. The simulation is an evolutionary robotics model of an agent controlled by a homeostatically plastic neural network where the connectivity is modified by a pre-synaptic Hebbian rule when the firing rate of neurons goes out of pre-specified bounds (inspired on Ashby’s homeostat). The very same underlying architecture supports a developmental process, an operant conditioning task and the spontaneous formation of sensorimotor habits (never selected during the evolutionary phase). The task (see figure 1) consists on distinguishing two different colored food sources with changing profitability (food source types alternate in random intervals from “profitable” to “poisonous”). 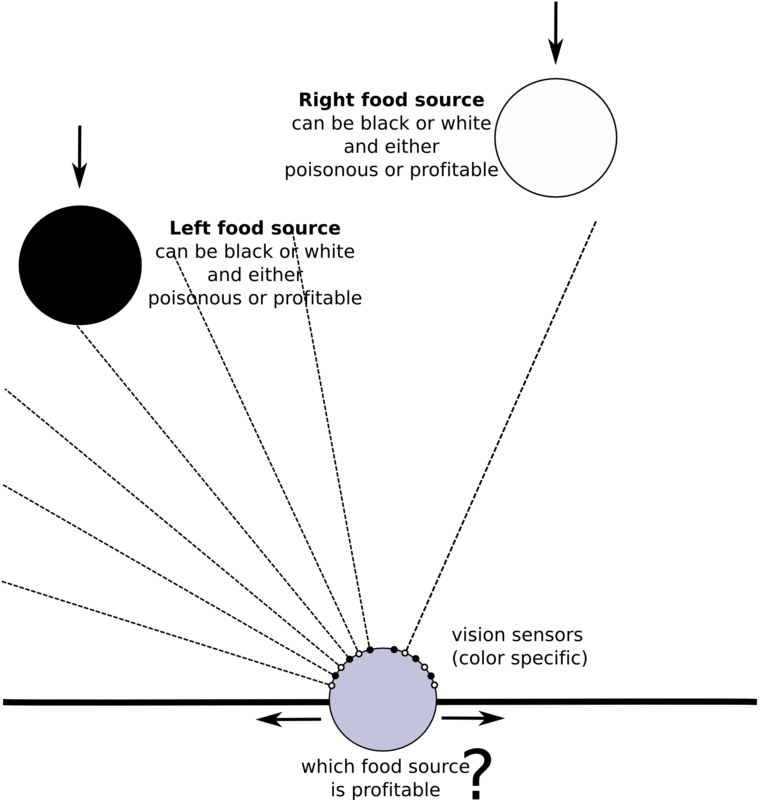 The agent has two arrays of sensors (one for each color) and an additional sensor to evaluate the profitability of the food-source. 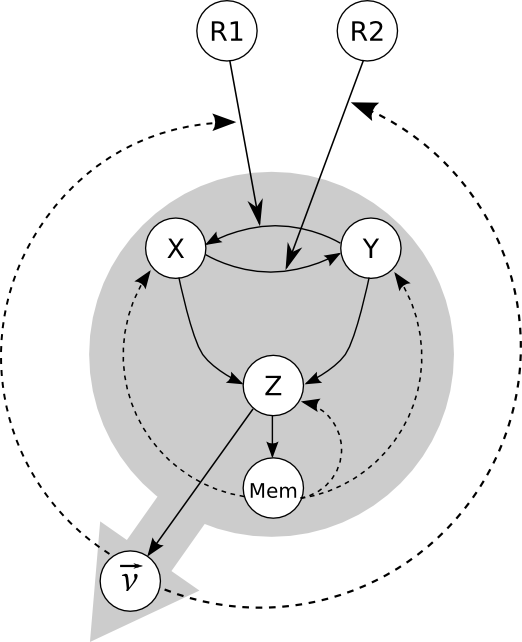 The control architecture is a fully connected Continuous Time Recurrent Neural Network with presynaptic Hebbian rule that is activated if the activity of pre or post-synaptic neuron is either to high or to low. Learning rule parameters are evolved to optimize the operant conditioning task with an additional fitness reward for internal stability. The agents are initialized with synaptic connections set to zero, a phase of development is observed after which the synaptic architecture is stabilized and the robot performs adequately on the operant conditioning task (distinguishing between profitable and toxic food). In addition, the robot can develop new habits in circumstances that were never encountered during evolution: e.g. the presentation of the same colored food source at the right produces a preference for turning to the right or alternating preference to different colors. Together with my PhD student Bruno Santos (who is in charge of the simulations) I am currently doing some research on brain oscillations and robotic models implementing Kuramoto networks on phototactic robots. 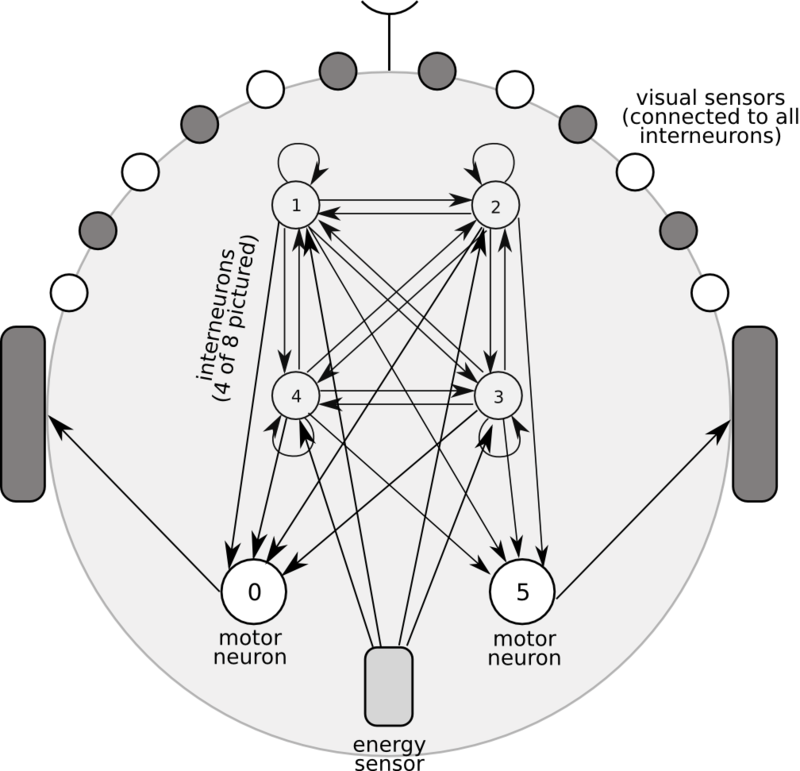 The resulting brain and behavioural dynamics are analysed within Kelso’s coordination dynamic framework. 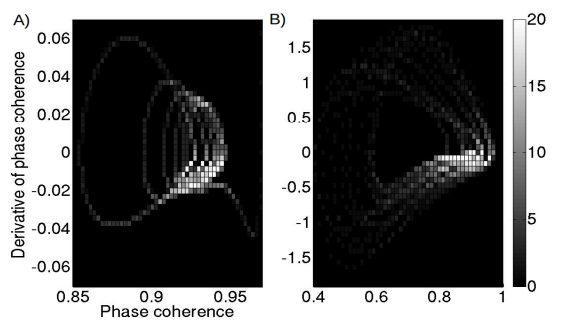 We found that: a) during a whole behavioural episode of phototaxis the robot’s brain undergoes different metastable dynamical regimes of phase-lock and phase-scattering, represented by the relative phase and phase coherence among oscillators; b) even for a simple task, metastable coordination patterns and functional behaviour emerges without the need of a specific synchronization signature (see figures 3 and 4) and, c) sensorimotor loop dynamic play a critical role generating and sustaining functional metastable regimes of brain activity by modulating the network’s control parameter. A simple prof of concept through which we are learning to interpret the oscillatory dynamics of full brain-body-world coupled systems. 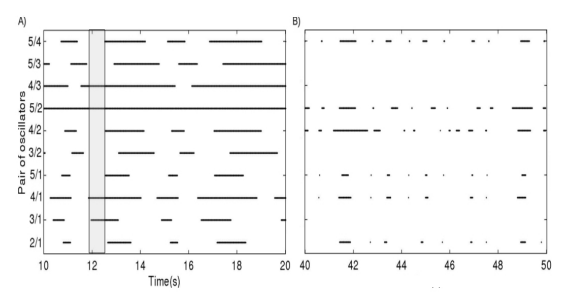 Figure 5: Phase coherence density plot for 6 oscillator Kuramoto network. Metastable patterns of phase relation can be seen in this plot, it is the whole pattern that is functional to generate behaviour, not just the phase locking. 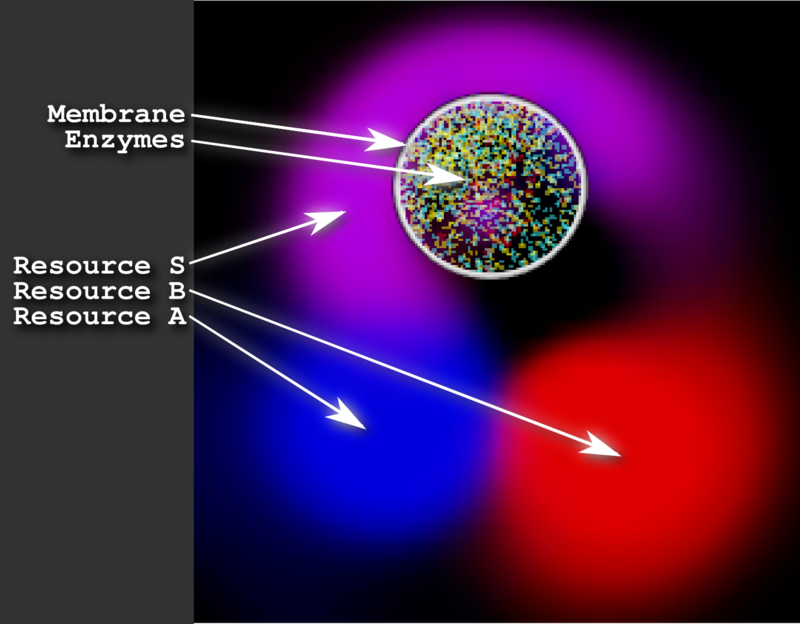 There is a second simulation framework (developed by Matthew Egbert) that we are using to explore some philosophical aspects of the origins and minimal forms of agency in protocellular systems. The focus of research is to explore the interaction between metabolism and behaviour in minimal protocellular systems on what Di Paolo and Egbert have termed a “chemo-ethological” framework. Previous models of minimal protocellular life have modelled metabolism independently of behaviour, whereas models of adaptive behaviour tend to ignore or assume a number of metabolic or physiological “needs” that organism have to satisfy in order to be adaptive. Through these simulations we explore the emergence of such adaptive norms and the way in which metabolism itself can modulate behaviour in relation to such norms. Aspects of the biological embodiment of adaptive behaviour, sensitivity to self-generated normativity and interactivelly sustained metabolism can thus be explored in simulations. Figure 6: Chemotactic behaviour of and adaptive protocell simulation, the system visits different food sources according to its metabolic needs. Figure 5: Organizational structure of a simulated chemtactic protocell. X, Y and Z are metabolites, R1 and R2 resources and Mem are membrane particles. Dashed lines indicate contraints and continuous lines indicate chemical reactions. Figure 5 (above) shows the relational organization of metabolic and behavioural processes on a simulated protocell. A minimal metabolism is coupled with behaviour generating mechanism an is thus capable of modulating behaviour according to the “norms” defined by metabolic dynamics. The emergence of norms is conceptualized as the viability conditions of the far-from-equilibrium nature of the chemical reactions involved. The agent is capable to explore the environment tunning its behaviour towards the most needed metabolites (see figure 6, 7) and moves towards higher profitability sources: it is an example of adaptive action selection without sensors, without explicity encoded action or action selection modules and without explicitly defined norms or value functions (as it is often modelled or assumed in robotics). We are currently exploring models of metabolism-dependent bacterial chemotaxis: a field of biology that remains underexplored despite its central relevance for the origins of agency and adaptivity. Together with Matthew Egbert and Ezequiel Di Paolo, I have been exploring the evolutionary implications of metabolism-based agency (i.e. behavioral patterns that are controlled by metabolic dynamic): we have observed that interesting positive feedback effects can be established between the norms (requirements and possibilities of survival) that emerge from metabolism and its direct influence on behaviour. We have termed this process as Behavioural Metabolution. Egbert, M., Di Paolo, E. and Barandiaran, X. (2009) Chemo-ethology of an Adaptive Protocell. Sensor-less sensitivity to implicit viability conditions. European Conference on Artificial Life 2009, accepted. Barandiaran, X. (2002) Adaptive Behaviour, Autonomy and Value systems. 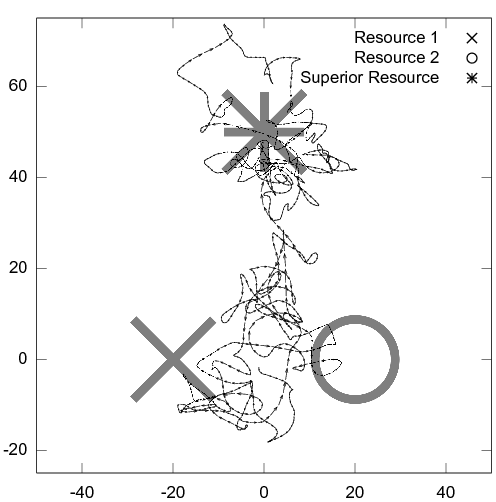 Normative function in dynamical adaptive systems (University of Sussex, Brighton, UK). Barandiaran, X. & Di Paolo, E. (2010) Homeostatic Plasticity in Robots: from development to operant conditioning to habit formation. Proceedings of CogSys2010.